With the update to Windows Phone coming later this year, Internet Explorer 9 will be included. With it comes all the HTML5, and hardware acceleration that IE9 brought to Windows, but now in your pocket. To sum up, Internet Explorer 9 on Windows Phone renders at 23 fps, Chrome comes in at 11 fps on Android, and Safari on an iPhone 4 comes in at a dismal 2 fps. As some of have may have noticed over the last few days, there's been a little addition to the sidebar on my blog. Inviting you to download the Paul Smith's Blog application for Windows Phone 7. What's the deal? Well late last year I started looking at mobile applications for Gamercast, after messing about with the Visual Studio as I always do and copying and pasting various bits of sample code together, I decided to give up. If I did manage to get it working, there was no offline reading, no ability to view comments on entries etc. 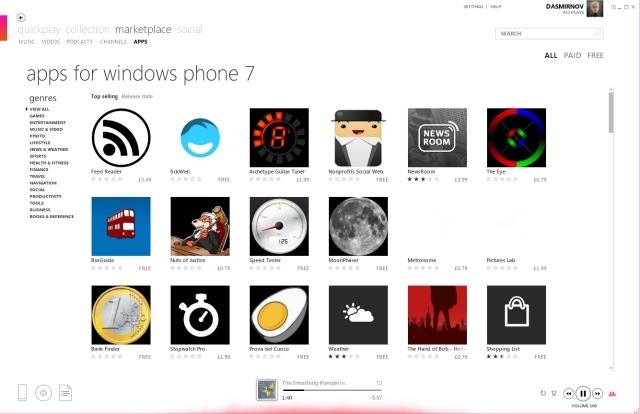 So I started looking at other solutions, like AppMakr but didn't like what they had to offer for Windows Phone 7. Then I came across FollowMyFeed who had a much better hub style interface. After putting together a sample application, and sticking it in the emulator and running it, I could tell this was pretty much what I was looking for. The Gamercast application has been available for a week now, check it out if you haven't already and feel free to download the application for my blog too. I just need to find time to write more now. Over the last few days much has been made in the technology press about "disappointing" sales figures for Windows Phone 7. What exactly is this based on considering there are no official sales figures and is it true or not? Back on the US launch (no figures for Europe yet, where Windows Mobile is traditionally much stronger), an anonymous source was quoted by dozens of technology websites as saying Windows Phone 7 sold 40,000 units on day one. To date nobody knows who this source is. Is 40,000 units a bad figure for a brand new platform with low awareness? Not really. Although we don't have any figures to directly compare with the first Android phone, the G1, T-Mobile did announce they had sold a million in the first 6 months. On average that's a little over 5500 units sold per day. Of course for Google the technology press spin everything in a more positive light, the stories when the G1 came out weren't about disappointing sales figures. No they just made figures up saying it had 1.5 million pre-orders. Obviously out by several orders of magnitude, at least. Microsoft isn't given the same luxury. A few days ago figures of Windows Phone being outsold 15 to 1 by Android in the UK swept around; this has been covered on pretty much every technology news website. Where are these figures from? Katherine Noyes, a known Linux fanboy, someone who said Android has almost made the iPhone a "niche also-ran", writing for PC World say they're from a UK retailer. Well I'm from the UK maybe I've heard of them, someone like Expansys or Amazon or maybe o2 or Orange, or maybe even the Carphone Warehouse? Nope from someone called Mobiles Please. Err never heard of them, in all my years buying smartphones I have never heard of these people. Worse yet they're not even a mobile retailer, they're just a website that links to deals from other retailers. I'd call them a comparison website. Except Alexa has never heard of them, neither has Compete. When my blog gets more traffic than a so-called "UK retailer" you should be worried, especially worried when tech websites with millions of readers use them as a basis for a story about how Windows Phone 7 is a failure. Of course I have to congratulate Mobiles Please for all the free advertising they got, from nowhere to being mentioned on dozens of the biggest technology websites. All they needed was a crappy anti-Microsoft press release. Windows Phone 7 is undoubtedly doing better than the handset makers predicted, Orange are still having to dish out £20 vouchers to make up for the fact its taking them a while to get phones into people's hands. It's also certainly doing much better than Android was in its first couple of months, just looking at the daily active Facebook users coming from Windows Phone can tell you that, and that's a very conservative estimate for total sales. Without a doubt Windows Phone 7 will get to the million mark faster than Android. PC Mag coughed up an excuse of an article today, written by Dan Costa and titled "Windows Phone 7: Where Are the Apps?" it essentially argues that Windows Phone 7 has very few applications, or none if you read it by title alone. We already had some information stating it'll have over 2000 applications on launch. Microsoft have stated the development tools have had hundreds of thousands of downloads, and that it will have over 50 Xbox Live-enabled games on launch, that isn't including non-Xbox Live games. What's Dan's source of this information? The Windows Phone website, where he can only find information about seven applications "I could only find seven applications listed on the site: Twitter, eBay, IMDb, and four games". Of course by the same logic, the iPhone only has dozens of applications as that's all I can find on Apple's website. Of course if he bothered to look at where you actually download applications from, the Zune Marketplace he would have seen hundreds up for download already. That's up from a dozen or so earlier this week. Not bad for a platform which isn't even released. Microsoft might be tempted to think it doesn't need third party developers. That would be a huge mistake. I don't even know where to start with that one. What planet does this guy live on? Seriously? This is Microsoft if there's one thing they get is how important 3rd party developers are, heck that's what the whole PC ecosystem was built upon. It isn't hard to do a little work and find out where all the apps are. But Dan and PC Mag are obviously more interested in spreading FUD, hoping everyone who reads it by headline alone will assume Windows Phone doesn't support 3rd party applications. With Microsoft now preventing 3rd parties from performing massive UI overhauls, like HTC have traditionally done with Windows Mobile and Android with their TouchFLO 3D and later Sense interfaces, manufacturers and mobile operators are left to create applications and hubs - like everyone else. Obviously HTC have invested a lot of money over the years to create their own unique look and feel, so they'll try and recreate what they can on Windows Phone 7. Here's a sneak peak of what they've been up to lately. Here we can see a note taking application, with probably more fancy effects than what is actually needed. A weather application, probably one of the things HTC is better known for. A stock price tracker and a weird "loves me" application. We can also see a flashlight application, from the tile it looks similar to what they've done with their flashlight application on Android. I am glad that on Windows Phone 7 we can move this stuff off the start screen. As cool as this stuff is (minus the he loves me application) with it being so graphically over the top I'm not sure if it fits in well with the rest of the operating system. In the weather application for example the temperature sits where the application title would, but unlike everything else it, along with the rest of the information subtly moves around a bit, may be it helps visualise wind speed. Either way not exactly the most consistent application with the rest of the device experience. Either way, I'll be keeping the weather tile on my start screen. I'm surprised they haven't done a big tile for a clock, something else they're pretty well recognised for both on Windows Mobile and Android. Microsoft released the new Beta of the developer tools for Windows Phone 7. Probably the most interesting bit for end-users is the Windows Phone 7 emulator, which lets us have a little play with the device. However in the original only Internet Explorer is available but like always the guys at XDA Developers cracked that emulator image to unlock full functionality like they did with the last 2 CTP releases. So if you're curious what Windows Phone 7 will look like check out the video Long Zheng put together earlier. What I'm excited about is OneNote integration with SkyDrive - something we don't have with OneNote 2010 on Windows Mobile at the moment, it'll only sync with SharePoint. But it looks like with Windows Phone 7, we can sync directly with SkyDrive, which means Gamercast's shownotes can be done out and about now, sweet.